Indoor navigation is growing rapidly and the global indoor location market size is expected to reach $40.99 billion by 2022 compared to only $7.11 billion in 2017. But what makes indoor navigation so popular? And why isn’t traditional signage working anymore when people have been navigating by means of signs and maps for hundreds of years? As indoor navigation providers we may be biased, but we still think you’ll agree with us when we say that digital indoor navigation will eliminate traditional signage in the future and in this blog we give you four reasons why. 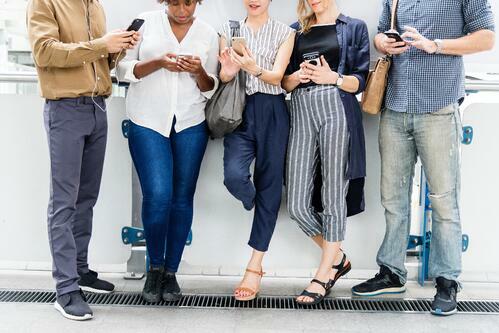 US adults spend an average of three hours and 35 minutes per day on mobile devices and nearly all of this time is spent on smartphones. But that’s not all. Apps account for over 90% of internet time on smartphones, which is why an indoor navigation app is a powerful tool. Turning to our phone whenever we need information is becoming part of our DNA. We’re so used to utility and lifestyle apps that it’s our second nature to rely on them whether we want to track workouts, stay in touch with friends, check the weather report, or get directions. With the development of smart things, IoT, virtual assistants, etc. there’s no doubt that apps will eventually be used to control every aspect possible of our lives meaning that in the future we’ll turn to our phone to find a venue’s indoor navigation app even before considering to look for traditional signs or maps. Today signs and maps are viewed for less than a second. We make a quick judgement and if we can’t absorb the information to find our way quickly and easily, we’ll look elsewhere. This means that the effect of traditional signage has been considerably reduced. The reason traditional signage isn’t working as it used to is information overload. We’re constantly bombarded with information and noise, which makes it hard for us to take in information. When we suffer information overload, we compensate by blocking new information. This means we may be unable to take in information that we need, even if we’re looking right at it. The strength of an indoor navigation app is that users don’t have to take in information. With accurate door-to-door navigation at the palm of their hand, they can just follow the directions as they go without trying to remember the next turn. In the old times venues were smaller and had just one purpose. Convention centers were used for exhibitions, stadiums were used for sporting events, and hospitals consisted of just one building. Today stadiums and convention centers are melting pots for sporting events, festivals, concerts, fairs, and exhibitions. Hospitals are enormous and rapidly growing complexes that spread across cities and so is university campuses and corporate offices. This means that today’s venue has an ever-changing layout making traditional signage expensive to maintain. Add to that the fact that even the smallest mistake in a printed sign or map can make it useless. With digital navigation venues can update their own maps. This means that there’s no additional cost even if the layout changes daily. Additionally, indoor navigation provides you with invaluable insights, such as people flow. This allows venues to constantly improve the layout and increase both infrastructure and the overall experience. So, traditional signage may have worked well back in the days, but it’s too outdated for today’s digitized world. The smartphone is unlocking consumer control, empowerment, and choice to an extent that has never been seen before. Marketing is moving from mass marketing to massive customization and top marketing executives even believe that we will build brands in segments of one in the future. The access to the internet and answers to practically any question, has made us more informed but it’s also making us more demanding and impatient. We’re used to getting the exact answer to our questions whenever we need it wherever we are. We don’t want to stare at a map showing all of the hospital corridors. We want the exact route from where we are to where we want to go. Not where everyone else is going. With digital navigation users can search for their destination and they can even choose to see relevant points of interest along the way, such as restaurants, vendor machines, or rest rooms depending on their needs. It can also be used for marketing purposes in hypermarkets, shopping malls, convention centers, or stadiums where shoppers, attendees, and fans can receive personalized offers based on their position. This way, digital indoor navigation satisfy our need for both instant information and personalization. If you want to know more about indoor navigation and future-proof your venue, take a look at our indoor navigation solution, MapsIndoors, and get inspired by our showcases.